Slattery recognises that a motivated and skilled workforce is fundamental to providing excellent service. We are constantly seeking to find new ways to support staff in developing personally and professionally and in achieving work-life balance. Slattery is an established, dynamic and highly regarded company looking for highly motivated Quantity Surveyors and Cost Engineers who demonstrate potential in utilising their skills to deliver maximum benefit. 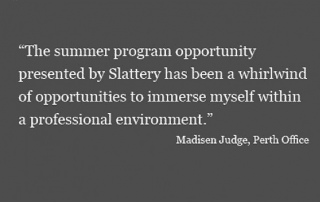 This year, Slattery has been delighted to welcome 13 students into the program, with six cadets in Melbourne, four in Sydney and three in our Perth office. Students have come from Curtin University, The University of Melbourne, Deakin University, University of New South Wales, University of Technology Sydney, University of Newcastle and University of Western Sydney.